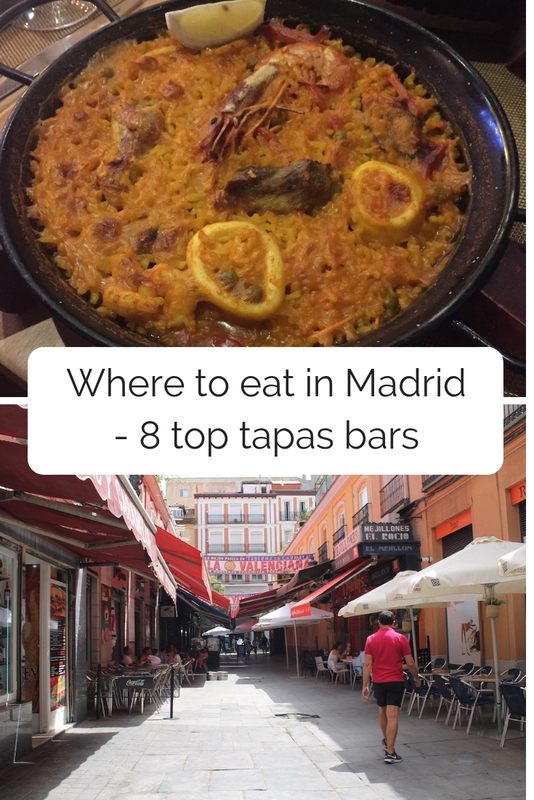 Madrid is an amazing destination for food lovers and during my recent visit to the Spanish capital I totally embraced the taps lifestyle. It’s all about getting together with friends and family, enjoying a small dish or two over a drink, before moving on to the next tapas bar and doing it all over again! You don’t end up bloated, something that can happen after a big, heavy meal, instead of having three of these a day you simply snack on delicious Mediterranean food throughout! As this was my first visit to Madrid, we met up with some local friends, Ana and Matt, on our first evening, who were kind enough to treat us to a tapas food tour of the city. Then we also got some tips from our lovely free walking tour guide, Marina, who was happy to recommend a few of her own favourite tapas spots. 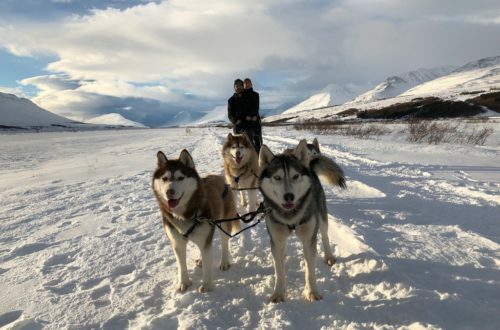 Having tried them out – and loved them all – I wanted to share these locals’ recommendations with you, so when you visit this wonderful city you can enjoy them for yourself! Where to eat in Madrid! 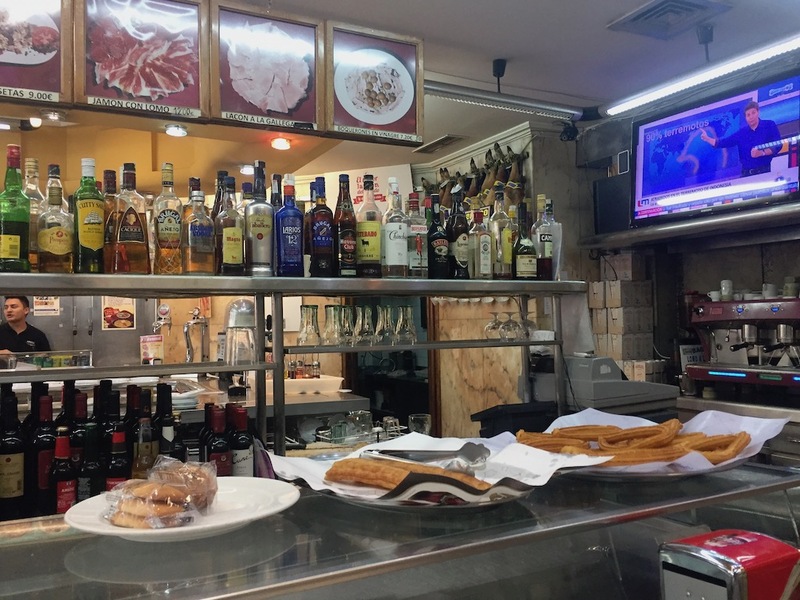 A Madrid specialty is the bocadillo de calamares (squid sandwich) and there’s one particular place the locals recommend you go if you’re after the best. Valle del Tietar is just off the Plaza Mayor, and although you might expect it to be a bit of a tourist trap, this is a spot the locals love to come to for their dish of choice. At just €3 per sandwich, the price isn’t bad either! Mercado de San Miguel is not a tapas bar, per se, or the cheapest place to get tapas, but it’s still loved by tourists and locals alike. This food market is made up of stalls offering everything from Spanish meats, wines and fresh seafood through to fruit, churros and bocadillos. In its centre there are some tables for you to eat your purchases then and there, or you can take them off and eat them while you explore more of the city. The cones of chorizo looked amazing, as did the cakes, but we actually didn’t try anything when we visited, as we’d just eaten beforehand! This classic tapas bar can be found in Madrid’s literary district, a gorgeous area made up of old streets and beautiful squares. This is where we found many of the best tapas bars and we loved this one so much we visited twice. The bar is essentially a long, thin restaurant with a TV screen at the back that mainly plays music channels. We loved it here because the staff were really friendly, the prices good and the food delicious. Dishes we tried here included the Spanish omelette, homemade croquettes, meatballs and fried potatoes with eggs and Iberian ham (the best ham, egg and chips you’ll ever have! ), all of which we enjoyed. I particularly liked that you could order a mix of 5 dishes for €26.90, which was perfect shared between the four of us. On our return visit we decided to go for paella, which didn’t disappoint. We shared a mixed and seafood paella between the three of us while Rosie couldn’t wait to try the black risotto – made with squid ink, squid and prawns. 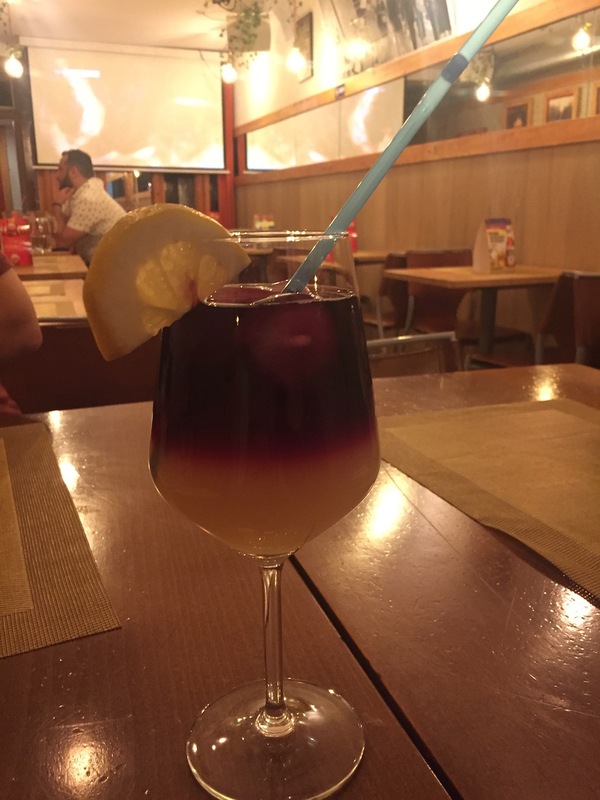 I also highly recommend their tinto de verano – the perfect summer drink – and also their dips! Scoop up their tomato and garlic dip with fresh bread. It’s divine! Don’t let the name confuse you, the ‘ham museum’ is a chain of tapas restaurants found across Madrid. This is ‘fast food’ tapas – 100 Montaditos is like a merging of McDonalds and Subway, given a much classier, Mediterranean feel. 100 Montaditos ‘does what it says on the tin’, it offers 100 different montaditos, which are essentially small ‘tapa’ size sandwiches. Head up to the counter to make your order, then either wait ‘till your called or your buzzer announces your food is ready, then pop over to the pick up area to grab your freshly prepared food. This restaurant chain is found all over Spain and is great for light, inexpensive food, as the montaditos are usually sold at the stupidly low price of €1 each. They’re small, to be sure, but they’re fresh and tasty – I personally thought they were just as good as any bocadillos we bought at independent tapas bars across the city. If you want to keep costs down 100 Montaditos a great option, we went there regularly for lunch, giving us more money for our evening trips to the tapas bars! 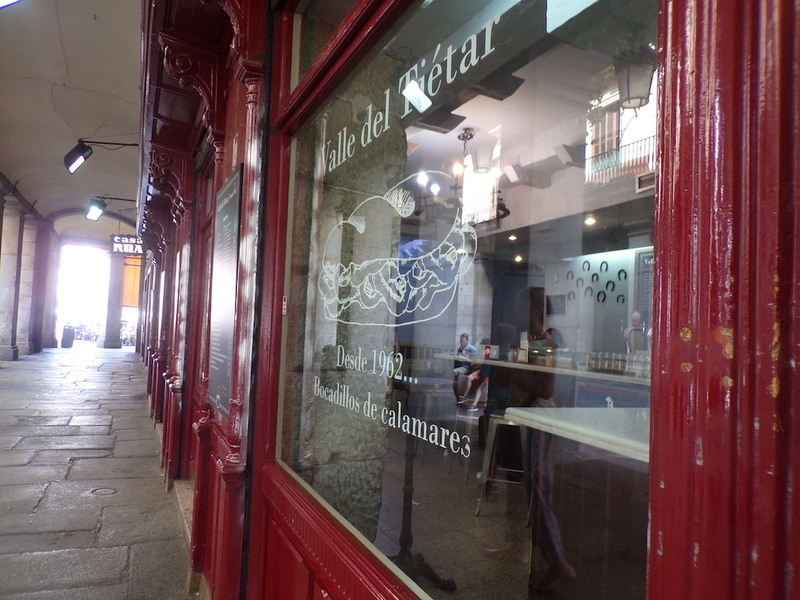 At the other end of the scale, Taste Gallery is one of the more upmarket tapas spots we visited, right next to the Mercado de San Miguel. Although more pricey than some of the other options the food doesn’t break the bank and you know it’s high quality. Here we tried some of the classic tapas dishes such as patatas bravas and broken eggs with ham, but it was here we also discovered amazing salmorejo. This is a cold soup, very similar to gazpacho, but much, much tastier. Basically it’s cold tomato and garlic soup, and this garlic lover thought it was absolutely amazing. 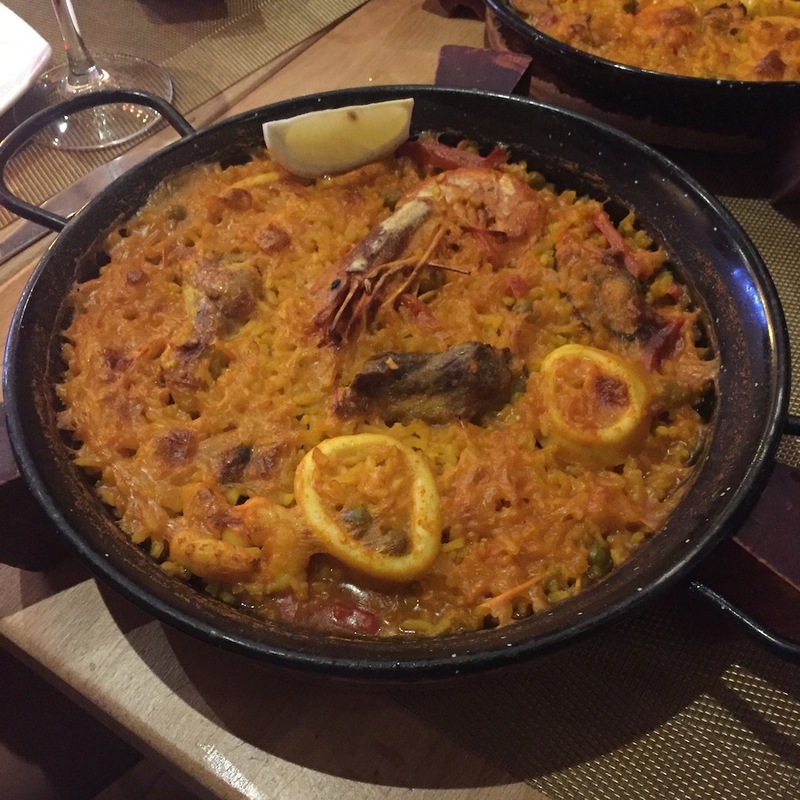 When you visit to Madrid, make sure you don’t miss out of this dish! 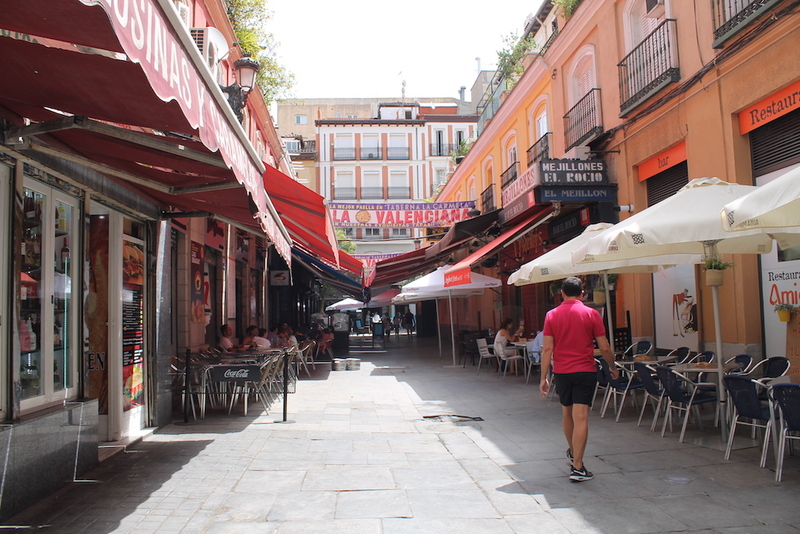 During our walking tour of Madrid we passed Pasaje de Matheu and was told it was a great street for tapas. 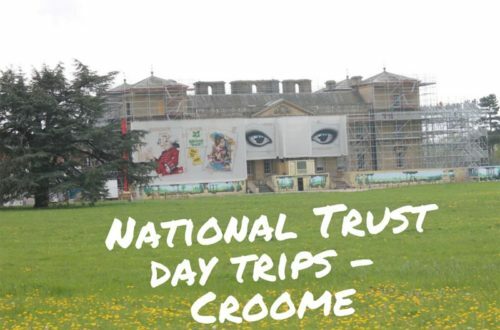 Sadly we didn’t make it back there to try any of the bars out for ourselves, but thought I’d add this in there for people to check out if they’re in the area. Santa Ana square at the heart of the literally district is another great spot for tapas, with a huge selection of bars to choose from in the square, as well as the streets around it. Marina told us her favourite tapas bar to visit with friends is Lateral, so we decided to try it out for ourselves the following day. We didn’t think the service was the best (one of our dishes didn’t arrive and we had to reorder) but the food itself was really good, and the menu had some dishes that we hadn’t seen elsewhere, such as the sirloin with glazed onion. My personal favourite however, was the albondigas (meatballs). These were the best I had in the whole of Madrid! 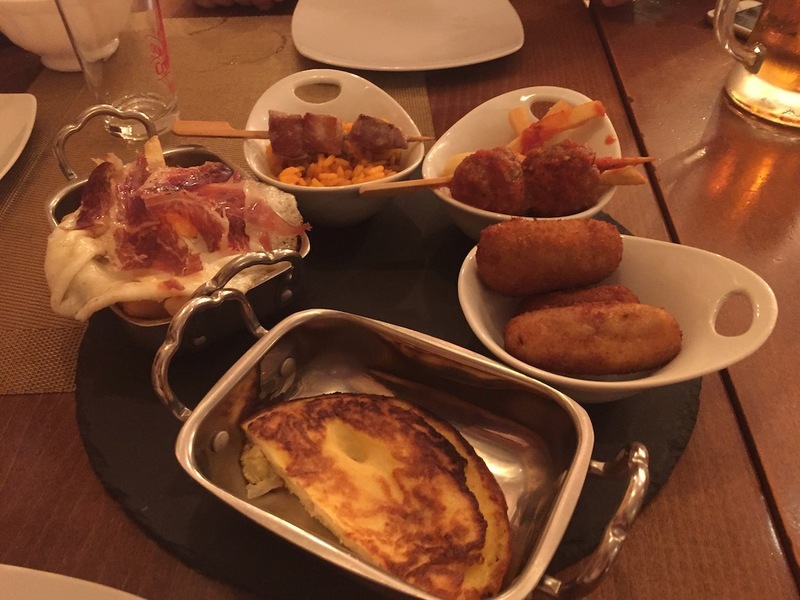 Most tapas bars focus on savoury dishes – sometimes only one or two per place! 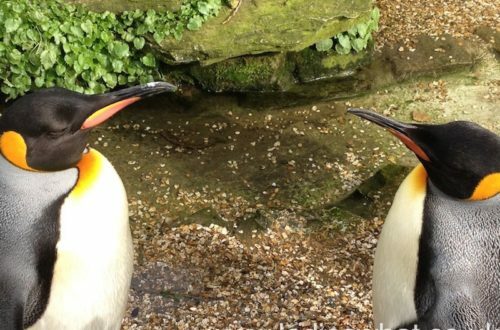 – so what to do if you’ve got a sweet tooth? Well coming up soon I’ll be sharing my top tips for the best churros in Madrid, but in the meantime why not check out my recommendation for afternoon tea in the city. 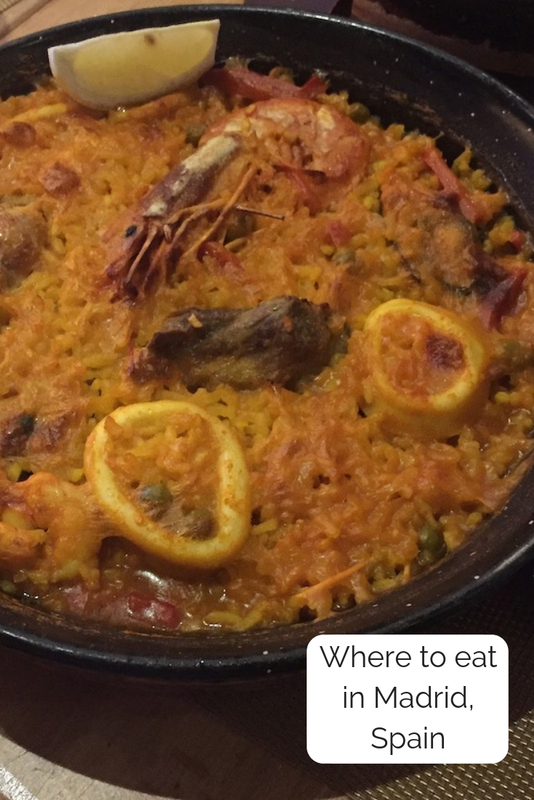 Make sure you keep an eye on the site so you don’t miss more Madrid foodie top tips! It’s a great way to try a variety of new things, isn;t it! Oh wow, I bet that was such a great night! 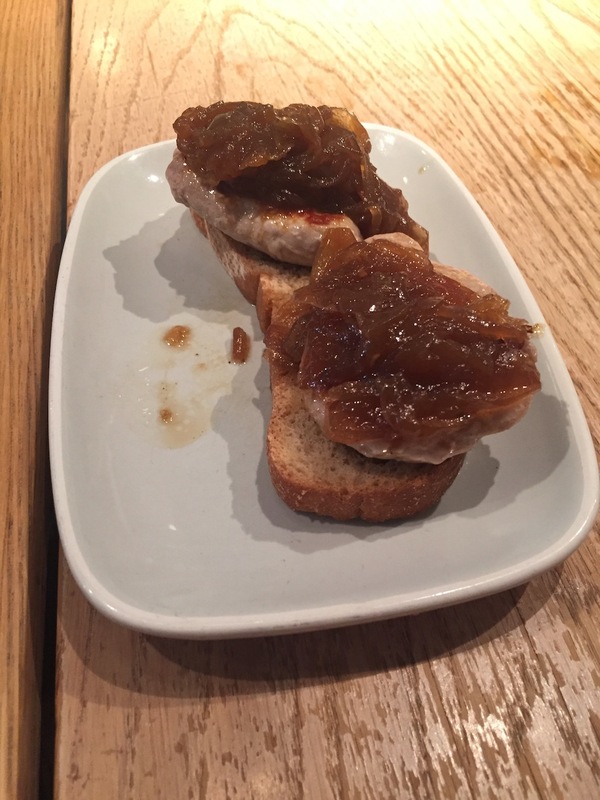 I am a local (madrileño) and my contribution is a route to sample five classic tapas in a very short tour. Each bar is still a stone’s throw away (or less) from each other. This is the map. Click on the icons. I love the foodie culture there, I could snack all day and never feel bloated!